The 2018 Atlantic Hurricane Season has been relatively quiet so far compared to previous year. However, last weeks showed the development of the season’s first major hurricane, Florence. As for most Atlantic hurricanes, it originated from a tropical wave off the West-African coast and during its path along the Atlantic basin it went through several stages of strengthening and weakening due to fluctuating sea surface temperatures and vertical wind profiles. 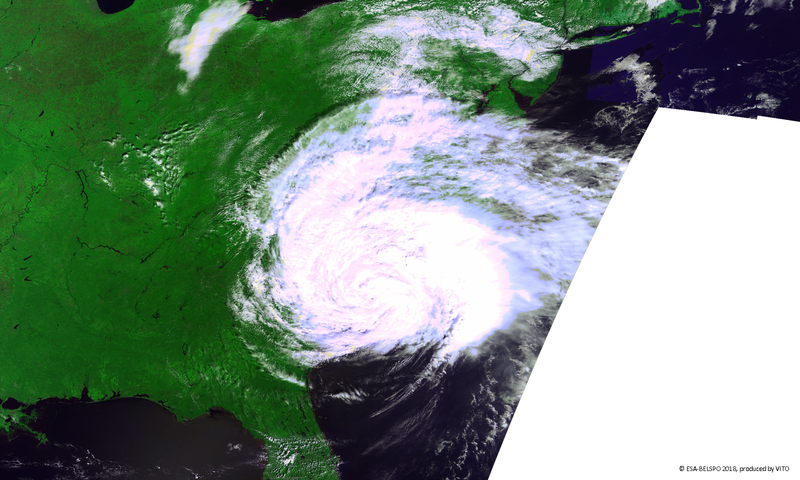 The 1 km image of last Saturday, 15 September 2018, one day after making landfall as a Category 1 hurricane over Wrightsville, North Carolina, Florence was captured by PROBA-V in its entirety. Its high outflow clouds extend mainly into its upper quadrants over several thousand kilometers. The bands with the highest wind speeds and most intense rainfall occur within a few hundred kilometers from Florence’s eye.